The ending of 2018 brings to mind the potential that 2019 has. While they’re seldom maintained, New Year’s resolutions often reflect our desire to reach our potential, but wishful thinking is not the way to do that. You’ll reach your potential when you work towards it with focus and a strong work ethic. In this social-media crazed culture that we live in, it’s so common to judge one’s successes based on what others publish about themselves, never mind the fact that you don’t know the failures they experienced to reach where they are, or if where they show they are is really where they are. Just like the kids who didn’t study for a pop quiz in grade school and they spent time looking around to see how others answered the questions, far too many of us are so busy looking around at what others are doing that our life’s work is being neglected. One simple key to accomplishing the goals that are ahead of you is to keep your head down. This means to focus on what you desire to accomplish with a consistency that enables you to grow towards your goal(s) without being distracted. When encouraging the Colossian church to put off worldliness and put on newness in Christ, Paul exhorted them to “set your minds on things that are above, not on things that are on earth (Col. 3:2).” Not start believing and Abracadabra, you’re like Jesus. No! Paul says that spiritual growth requires intentional concentration. Just like spiritual growth, all of the areas in your life that you acknowledge need growth will require intentional concentration. How are you doing? Spiritually? Financially? Mentally? Emotionally? In the areas that you desire to grow, which I hope are all of these and more, keep your head down. For spiritual growth, concentrate on the things of God in place of spiritually malnourishing things. For financial growth, create a budget and live by it. Trust God with the tithe. Be a saver, and not just a spender. For mental growth, read; and not just social media statuses. Read books. Ask for referrals. I suggest kindle books because they can go everywhere with you (there’s an app for that). For emotional growth, pay attention to yourself and what triggers negative emotions for you. When you identify negative triggers, premeditating responses really helps to re-shape your experiences. None of us are perfect, and neither are our attention spans, but we will do a great service to ourselves when we intensify our focus by following Paul’s advice to “set your mind…”. May the end of 2018 and beginning of 2019 find you focusing on the goals that are ahead of you! Just Do It: We Need Good Wine! Nike is promoting fighting for your dreams that other people think are crazy, even against inequalities based on gender, disability, nationality, and religion. The initial rollout of this ad incited an uproar; not because it promotes fighting for dreams against opposition, but because the ad features Colin Kaepernick, who’s dream includes standing against racial inequality and police brutality by kneeling during the national anthem during NFL games. Kaepernick used his platform to fight for his dream, and is the perfect athlete to discuss sacrificing for what you believe in, as he sacrificed his NFL career to take this stand. Even Nike is demonstrating the message of this ad through sacrificing customers who hide behind the veil of supposed patriotism to ignore the realities of race in America. Racial disparities and racist ideas are as ingrained into the fabric of American culture as apple pie and baseball caps, so for Nike to promote dreaming against this reality, despite the backlash, sets an example worth following. The wide range of consequences, from the burning of apparel in a #JustBurnIt campaign, to a tweet from #45, who Michael Eric Dyson referred to as a “lugubrious leech”, have not deterred Nike from following through with the promotion of this ad. - Jesus is at a wedding He was invited to. - Mary tells Jesus the wine ran out. - Jesus tells Mary wine running out has nothing to do with them. Jesus was not going to interfere with the situation until his mother interrupted Him, THEN the first miracle in His ministry took place. Jesus turned the water into wine. Sometimes, God’s interference requires our interruption! That means that if we’re not willing to address needs by interrupting those who feel like the societal “wine shortages” aren’t their problem, we may miss miraculous transformations that can happen because of our interruptions. Mary’s response to Jesus’ dismissal shows that she believed for something that she had never seen enough to interrupt Jesus and the servants. Jesus says “this has nothing to do with us”, and Mary replies, “do whatever He says.” This demonstrates that faith is the work we do towards seeing realities that we have not yet known. *We have not seen racial equality in America. *We have not seen gender equality in America. *We have not seen equality for the disabled in America. *We have not seen religious equality in America. *We have not seen liberty and justice for all in America. ...but we can, by faith! Mary, Nike, and Colin Kaepernick show us that when you believe in something, you’ll interrupt the unbothered to ensure that what you believe for becomes a reality. Here’s something to note: water turning to wine is attributed to Jesus as His first miracle, but HE NEVER DIRECTLY INTERACTED WITH THE WINE. He sent the servants to fill large jars of water, and when they brought it back to the host it was “good wine.” What we see here is that GOD’S POWER was exercised through THEIR WORK! We need “good wine” in the areas where what should be is lacking in communities, families, churches, and society at large. Let’s be committed to being like Mary who was willing to be interruptive, and like the servants who did the work to fetch the water that Jesus transformed. Nike is doing a great thing by including Kaepernick in this ad campaign, and we see through this experience that there is a price to be paid for doing what is right in the face of complicit and comfortable supporters. *PS: I’m writing this blog wearing a Nike tee, Nike shorts, and Nike sneakers. Selah. 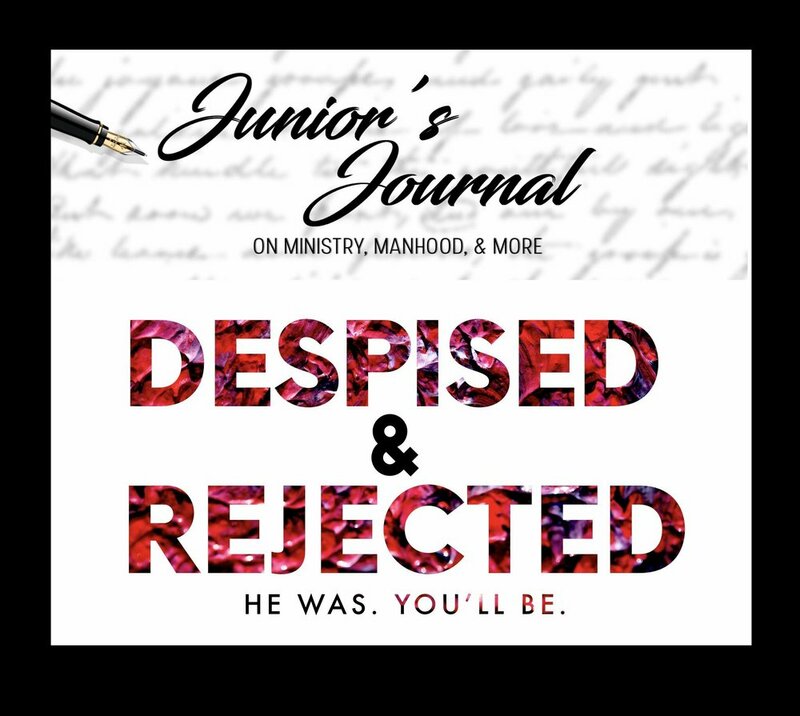 Despised & Rejected: He was. You'll Be. Jesus Christ was despised and rejected, and you will be too! It’s nothing to complain about, or feel sorry for yourself about, but it is something to be aware of. It can be natural to expect that those who God uses you to bless would bless you in return, or at least not seek to hurt you, but there will always be mean, miserable people who seek to discredit who you are. Christian ministry is a continuation of the work of Jesus Christ, but we not only share in the blessings, we also share in the suffering. God allows us to be glorified by filling us with God’s power, yet God allows us to be humbled through hurtful experiences we encounter, sometimes at the hands of those we’ve been called to help. If you’ve experienced the pain of feeling despised and rejected, know that you’re in good company. Jesus Christ, who is everything, was considered nothing! This proves that you can’t do enough for people to make them see good in you. People will forget miles of good for an inch of what they feel is bad. Even with that, we have a responsibility to stay true to who we are, and what God has called us to do. As it is with Christ, so it is with you and I: How people see you does not determine who you are! After a disagreement earlier this year, I expressed to my dad my annoyance with people who repay my kindness with meanness. My dad taught me to keep helping the people who hurt me because my nature is to help, and if I let the ones who hurt me change me, I’ve given them a power to control me that doesn’t belong to them. Jesus trusted God through His suffering. While that’s easier said than done, it’s our key to surviving our suffering seasons. Let your trust in God give you the encouragement that is needed to be found faithful in a work that is sometimes hurtful. The fact that Jesus didn’t respond is a glaring part of his experience of being despised and rejected. I encourage you not to return revile for revile. Don’t give harsh words as an answer to harsh words. Growing up my mom would call it being “low down”. Don’t be “low down”! Let your validation come from God, and not people, and you can channel the hurt we experience in life and ministry as a push towards being better versus being bitter. Attempts to discredit you are coming. Gossip and rumors will carry your name. You may never receive honor, respect, or appreciation from those that your life is a blessing to, and hopefully you will, but if you don't, serve as unto the Lord Jesus Christ. Give as unto the Lord Jesus Christ. Live as unto the Lord Jesus Christ, putting your trust in God in the high and low experiences, and you will qualify to experience what the psalmist declared, that "he (God) will act". I'm a witness that God will act on your behalf when you trust God, although you've experienced being despised and rejected. Jesus proves for us that you can overcome every word said and deed done in effort to despise who you are and reject what you're called to be. "Must Jesus bear the cross alone, and all the world go free? No, there's a cross for everyone, and there's a cross for me." Speaking to groups of people often requires asking that they be silent. It doesn’t mean that what they are doing or discussing when the speaker talks is not important, but listening is harder when we’re preoccupied with what we’re saying or doing. Listening happens better when undivided attention is given to the speaker. This natural reality leads me to consider the spiritual question: Are we too busy to listen to the voice of God? God often speaks in stillness and smallness. If we’re not careful, we can miss what God wants to say to us because we expect God to speak extravagantly in the present like God might have in the past. Sensitivity has to be cultivated in the fast-paced society that we live in that is often too fast to sense the still, and too saturated to sense the small. When we take the time to center ourselves through silence and stillness, we give God the space to speak to us on God’s terms. Even Jesus took time away to be with God. I can’t help but to notice how in Matthew 15:29, Jesus went up to the mountain and He “sat down there”. If we will learn to get into the presence of God and “sit down there”, by pausing, reflecting, and being in resting, we can provide the platform of silence that God's voice can be best heard through. In his book Meditations of the Heart, theologian Howard Thurman says that “The streets of our minds seethe with endless traffic”, and this reality is what sometimes prevents us from hearing what God wants to say to us. I understand first-hand how busyness can get in the way of taking the time to be silent. We can become so busy doing work for God that we neglect our walk with God, but work for God evolves into God working through us when we prioritize our walk with God. It’s easy to sacrifice necessary time to be silent in the name of “serving”. Though this is common, we cannot pour out quality to others without giving God the space to fill us, otherwise we will run out of substance to pour. The spiritual substance from God that we need to live well and serve well can be received through stillness and silence with God. In our jet-setting, itinerary-based culture that can entice Christian leaders to take on a messiah complex where we feel we have to solve everybody’s problems, we need the “blessed quietness” that they hymn writer says when “He speaks peace to me, the billows cease to roll”. This suggests that a word from God can provide the peace that we seek in our lives when times get tough. In 1 Kings 19, Elijah was running for his life since Jezebel threatened to kill him as a consequence for proving that the God of Israel is the true God. The series of events that led up to Elijah experiencing God are interesting, because when God passed by Elijah, a great and strong wind happened, and after the wind, an earthquake happened, and after the earthquake, a fire happened, but God was not in the wind, the earthquake, or the fire. But Vs. 12 says after the fire, “a still small voice”. The help that Elijah needed to continue the work of his life did not come through some significantly sensational experience, but it came through God’s still small voice. This same Elijah, who was depressed because of how his ministry resulted in his life being threatened, heard from God, got new instructions, and continued doing the work of his life. Sometimes, it’s not that we need to change what we’re doing, or give up on our current efforts. Elijah needed a personal encounter with God, and so do we. We need to hear God’s voice. We need to feel God’s peace. We need to be reminded that the work we do for God is not of our own choosing, but it is God’s sending. I encourage you to take the time to invite God’s voice to speak to your spirit by being silent in God’s presence, and receiving the instruction, the encouragement, the correction, and the lessons that God wants to share with you. Here’s a takeaway truth: God has something to say, and it’s worth hearing. What’s left for us to do is examine ourselves to ensure that there are silent spaces in our lives that allow us to hear what God says. You cannot do well what you have not heard well, and you cannot hear well if you have not been silent. Enhancing the Essentials: STOP FAKING! As many of you know, I recently relocated from Rochester, NY to serve as Youth Pastor in Columbia, MD. Thankfully my moving process has been seamless, but during my apartment search, I noticed a recurring experience. Leasing agents would show me impressive amenities that were upgraded with modern architecture and technology to spark my interest, then in many cases, once we got around to seeing the apartment units, I was underwhelmed because they paled in comparison to the dynamic shared public spaces. After having several of these experiences, I began to request that we skip the amenities showcase because it was clear to me that there was a culture of over-communicating nonessentials in an effort to validate their worth. They showed me flat screens, pool tables, bbq grills, community gyms and spa spaces, and much more, but I was apartment hunting for a personal living space, not those things. I quickly noticed that, in many places, while the nonessentials where upgraded, the essentials were antiquated and less attended to. My apartment hunting experience caused me to search my soul. Consider this: Am I enhancing the non-essentials in my life in an effort to make myself appear more valuable? Jesus asked the disciples in Matthew 6:25, “Is not life more than food, and the body more than clothes”? He was encouraging them to give attention to what really matters in life, and I encourage you to do the same. Jesus went on to tell them to “seek first his kingdom and his righteousness...”, and just like the disciples, we have to keep the main the the main thing. God first, of course, then our own wellness and wholeness because I’m no good to others when I’m not good to myself. The value that you possess is not in what you have, or in what you do, but your value is in who you are! I encourage you to seek to BE, and not to GET. Be whole. Be well. Be kind. Be authentic. Be sane. Be intelligent. Be Spirit-filled. When you choose to BE, you will naturally GET. Education doesn't make you. More money won’t make you. More friends won’t make you. More likes, shares, and follows won’t make you. Life can be much less stressful when you take your confidence out of what you possess, and put your confidence in God. Allow God to develop the essentials of your life so that you won’t feel the need to use nonessentials to make yourself appear to be valuable. You have value, and it’s within! It’s God given. While popular culture may temp us to value what’s on us as indicators of our worth, I invite you to give attention to what’s within you, which for believers is what Paul calls in 2 Corinthians 4:7, “treasure”, which is the power of God. We have this treasure! Let’s act like it! P.S. Today is the 1 Year Anniversary of Junior’s Journal Blog. Thanks for reading!